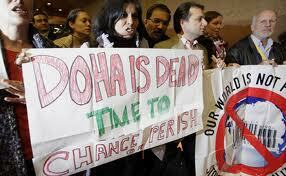 It has been almost 12 years since the concept of the “Doha Agenda” was developed. In the wake of several critics claiming that the WTO has failed as an international institution, Director General of the WTO, Roberto Azevẻdo recently warned that the institution has eight months to prove that it has a future. In London, he told the business community that “our aim now should be nothing less than to complete the Round and do it quickly”. Though he conceded that the world trading system had come a long way in bringing together world economies, he expressed concern at the current stall in the developmental process. He clarified that the “Bali package” was the beginning of a positive cycle and not merely a fluke. However, fears are abound that the partial success that was gained at the 9th Ministerial Conference (MC) at Bali last December will manifest in a sense of complacency among the Contracting Parties. The general consensus regarding the conference was that the developing countries, lead primarily by India, had clinched a victory against the might of the powerful nations of the West. Most notably, India’s “success” was attributed to the peace clause that allowed its current public stockholding program to be protected from future WTO litigation. But all this noise over Bali has to (unfortunately) be juxtaposed with ground realities. The prolonged delay in the implementation of policies forces the most ardent WTO-fan to quietly ask himself- Does our beloved WTO even have a future? And this question naturally leads us to an inquiry into what exactly went wrong. In the following two-part series, I’ll be looking into some of the factors which have influenced the way in which the Doha round of negotiations have taken place. The first is the unprecedented rise of the FTAs (Free Trade Agreements). This shows how regional (micro) factors have global (macro) consequences. Recently Australia went on an FTA-spree, closing deals with Japan, Korea and has now set its sights on China. Hence the question begs an answer: In the era of regional agreements (TPP, TTIP to name a few), does the multilateral framework of WTO have a bleak future? The second factor is the changing face of the international trade landscape. India, China and Brazil are the new kids on the block and their policies and actions deserve close attention. While India has made waves in the recent globing scene with its iron-firm position on its farm subsidies, China continues to be hit with WTO litigation right, left and centre. The Chinese authorities had only just come to terms with the China-Audiovisuals decision, when the China-Rare Earth era began. Both of these factors merit examination and hopefully I’ll be able take up a post each on the two issues. Hopefully we’ll find out if the WTO has its days numbered. Basically, it is an agreement signed by a certain limited number of nations, wherein they agree to reduce barriers to trade between themselves, as against the outside trading world.